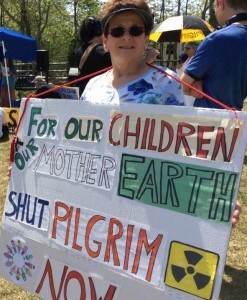 Cape Downwinders amped up their campaign to shut down the aging Pilgrim nuclear power plant with a Mad As Hell Mother’s Day Rumble on May 10. “Bring food, noisemakers and all your frustrations – We will make racket” announced the flyer for the event, which began with a picnic and rally at White Horse Beach on the western shore of Cape Cod Bay, next to the 42-year-old reactor. 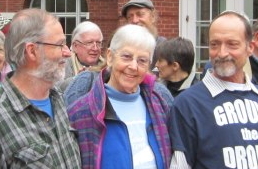 There was song, drumming, three original poems about Pilgrim by Cape resident Marge Piercy, and an update on the shut-down effort in the wake of two reactor shutdowns last winter due to storm threats and damage, including one emergency scram. 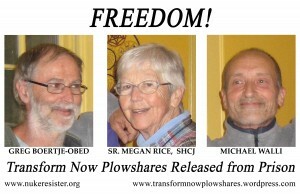 Freedom for Sr. Megan Rice, Michael Walli & Greg Boertje-Obed!! The Catholic nun and two military veterans & Catholic Workers spent 2 years in prison for their 2012 Transform Now Plowshares direct disarmament action at the Y-12 nuclear weapons complex in Tennessee. Sr. Megan Rice was due out in November, 2015; Greg Boertje-Obed and Michael Walli were due out in fall, 2017. 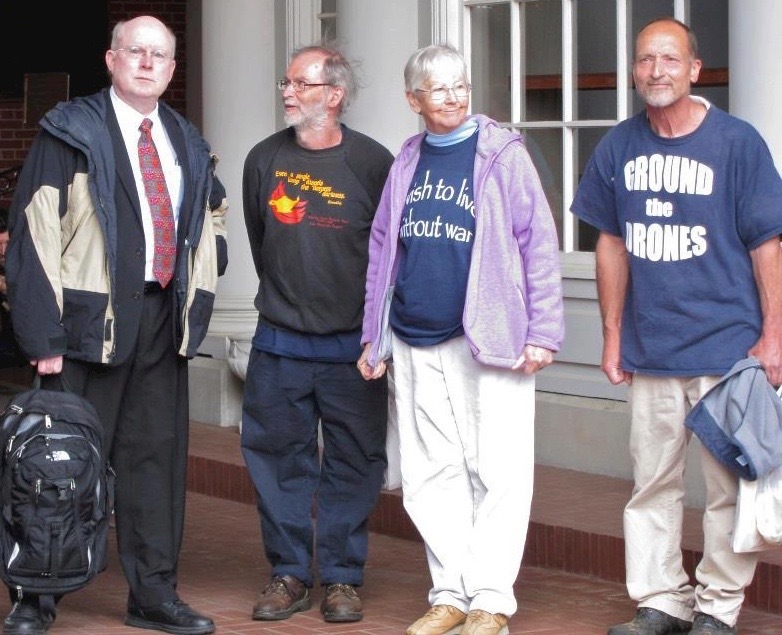 But their lawyers appealed their sabotage conviction… and it was overturned! Today (May 16) all three were released from prison!!! 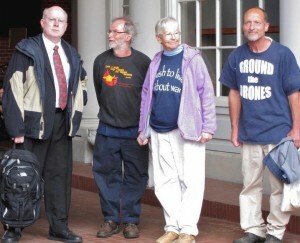 Their message – and the work – continues: DISARM NUCLEAR WEAPONS! Details to follow, including confirmation of their release from prison! 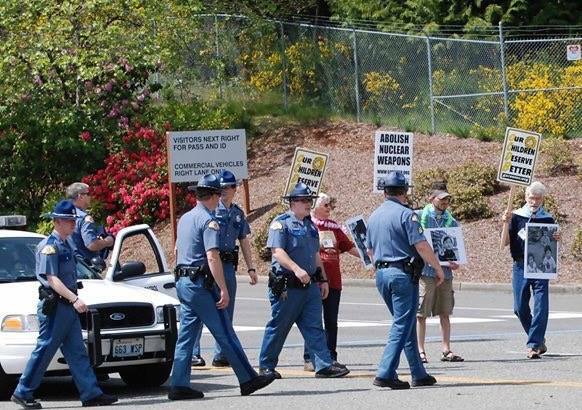 On Saturday, May 9, anti-nuclear weapons activists gathered at the main entrance gate to Naval Base Kitsap-Bangor, Silverdale, Washington, home to eight of the nation’s fourteen OHIO Class (Trident) ballistic missile submarines. Carrying signs saying “Our children deserve better”, five protesters walked into the roadway and blocked traffic entering the base. 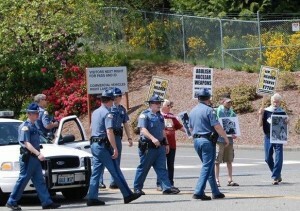 Washington State Patrol officers moved in and escorted the protesters off the roadway. In its 2-1 decision, the panel found the three lacked the requisite intent of an accused saboteur to “injure the national defense”, because their actions, while damaging property and motivated by a desire for disarmament, did not functionally affect the nation’s ability to initiate or defend attacks.